Fifty years ago this month, Hungarian workers, students and intellectuals, supported by sections of the army and police, rose in heroic armed revolution against the country’s Moscow-sponsored Stalinist regime. The uprising quickly spread from Budapest to the rest of the country, driven by the demands for national independence and democratic rights. A significant feature of the revolution was the emergence of workers’ councils. In an inspiring example of direct democracy, they established popular control of factories as a viable alternative to the bureaucratic stranglehold the regime exerted over production. They seemed to come out of nowhere, set up by workers who had never even experienced independent trade unions. After initial successes, the uprising was eventually crushed by a full-scale Soviet invasion that left thousands dead. Although the trade unions continued to resist for several months, workers’ councils were finally dismantled and their leaders arrested. Imre Nagy, who was catapulted to power by the revolution, was seized and finally executed almost two years later. The consequences of the Hungarian revolution and the Stalinist counter-revolution were far reaching. Communist Parties throughout the world lost large proportions of their membership. In France, half the membership quit. Sickened by the brutality of the Soviet invasion, people like historian E P Thompson left the British party for good. The Italian CP actually broke relations with Moscow in the wake of suppression of the revolution. Hungary was to prove the beginning of the end for Stalinism internationally. Hungary and other parts of Eastern Europe became part of the Soviet “sphere of influence” at the end of World War II as a result of cynical deals made between Stalin, Churchill and Roosevelt at the Yalta conference in 1945. They carved up Europe between them, deciding which country should be in which sphere. Greece, for example, was excluded from Stalinist control and the British army was allowed to take part in crushing the revolution in that country. Ruled by a fascist regime from the 1930s, Hungary had joined Nazi Germany in the invasion of the Soviet Union. In 1945, Soviet troops liberated Hungary with the loss of 70,000 lives. Along with Russian troops came a group of Hungarian-born figures known as Muscovites. They were chosen for unwavering loyalty to Stalinism and most were now Soviet citizens. “When they returned to Hungary after the war, they were not going home. Hungary had ceased to be home a long time ago for most of them. 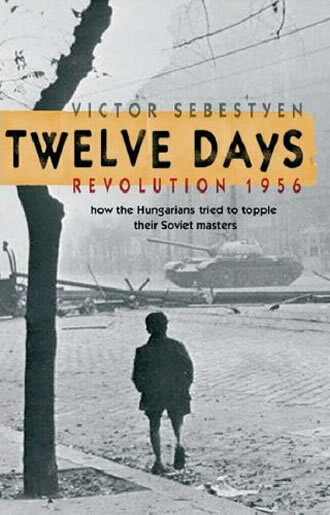 They returned as representatives of a foreign power to serve the interests of the Soviet Union,” argues Victor Sebestyen in his new book on the Hungarian Revolution. * Others who had fled Hungary in the 1930s were not so fortunate. Many had perished in the Stalinist purges, including Bela Kun who had established a brief socialist republic in Hungary in 1919. Initially, the Hungarian Stalinists worked with other political parties in a coalition government and allowed parliamentary elections to take place. But the country was immediately asset-stripped by Moscow. Some 200 complete factories were dismantled and sent to the Soviet Union. A third of gold and silver reserves were taken. The Hungarian national budget for 1946-47 set aside as war reparations eight times the sum allotted for post-war reconstruction. The country’s currency collapsed and hyperinflation swept Hungary. By 1948, the other parties had been ousted or forced to merge with the Communist Party. All factories and banks were nationalised and farms were collectivised and placed in the hands of bureaucrats. The country was Russified, including army uniforms, public holidays and the school system. Russian words were even introduced - kolkoz for collective farms, for example. What Moscow had created was not a “Communist” state but a replica of the Stalinist bureaucratic state that had emerged out of a bloody series of events in the Soviet Union. The group led by Stalin engineered a counter-revolution that wiped out the political achievements of the 1917 socialist revolution. What began in the late 1920s with the expulsion of Trotsky, Zinoviev, Kamanev and other revolutionary leaders culminated in a series of bloody show trials a decade later. Millions were put to death or sent to camps, including virtually all the original leaders of the revolution. A totalitarian state replaced any vestiges of democracy while foreign policy included an unholy alliance with Hitler. The fact that much of this was done in the name of Marx and Lenin made these crimes even more abject and contributed to the spread of anti-Communist ideas. While the Russian revolution had degenerated, Hungary’s regime was deformed and barbarous from the start. Within a few years, Hungary, led by Matyas Rakosi, became undoubtedly the most brutal of the Stalinist regimes that were installed in Eastern Europe at the end of World War II. The secret police in Hungary was known as the AVH. Staffed by thugs, many of them from the former fascist regime, it ran a terror regime unsurpassed in the region. The arrest in October 1949 of foreign minister Lazlo Rajk on frame-up charges signalled the beginning of a great blood-letting. In a country of fewer than 10 million people, more than 1.3 million people were prosecuted and half of them jailed between 1950 and 1953. Some 2,350 were summarily executed. Many more rotted to death in police cells and concentration camps, which held more than 40,000 inmates. Of the 850,000 party members, half were in prison, labour camps, exiled or dead. By 1952, living standards had fallen by an estimated 20% and the average working week had lengthened. Famine conditions were reported in many parts of the country. After the death of Stalin in 1953, a collective leadership emerged in Moscow led by Nikita Khrushchev. Sebestyen explains how the Hungarian leadership was despised by Khrushchev and considered too brutal even for Moscow to stomach. Rakosi was summoned to Moscow and told that Hungary faced disaster. Reluctantly, Rakosi brought Nagy, a man he hated, back into the government. Although trained in Moscow, Nagy had rejected forced collectivisation and handed land to the peasants after the war. He was much more popular than Rakosi. The terror eased and things improved but the Rakosi-Nagy government was unstable. When in March 1955 Nagy was once again thrown out of government, he refused to recant his “errors” and was expelled from the party, increasing his popularity still further. From that time, Moscow allowed a semi-official opposition to exist in Budapest around Nagy in the hope that things would quieten down and Sebestyen notes: “…here was an experiment – the only one of its kind in the Soviet satellites – that had fateful consequences.” In October 1955, for example, 59 prominent writers and artists signed a manifesto protesting against the “administrative methods” used against intellectuals and demanding more freedom of expression. In February 1956 the world changed. Khrushchev delivered a bombshell in the form of his “secret” speech to the 20th Congress of the Communist Party of the Soviet Union. In a speech lasting several hours, Khrushchev shocked delegates by listing many of the crimes against the Soviet people carried out by Stalin’s regime. He denounced Stalin’s “cult of personality” and praised Lenin. The speech soon leaked out and was reported around the world. Khrushchev had not buried Stalinism nor the bureaucracy that still maintained a tight grip on people’s lives. But he had delivered a tremendous blow to the myths that had grown up around Stalin and brought out into the open the depth and brutality of his reign of terror. A feeling that a burden was lifted spread throughout Eastern Europe. In June 1956, Polish workers in Poznan went on strike in protest about exorbitant prices, high taxes and low wages. Soviet troops were stationed on the Polish border and it seemed they might intervene. But Khrushchev allowed the popular leader Gomulka, one of Stalin's political prisoners, to become Poland's leader. In Hungary, Rakosi was now criticised openly in public and at meetings. In July thousands attended a debate on a free press. Authority began to drain away from the Hungarian Stalinist bureaucracy and Moscow had Rakosi removed just as he was about to launch mass arrests of opposition figures. Replacing him with Erno Gero was a major mistake. He was an equally inflexible Stalinist, implicated in all the crimes during the terror. The opposition, feeling that the regime was on the run, got bolder. On October 6, 100,000 lined the streets of Budapest to witness the reburial of Rajk and four others hanged with him seven years earlier. Although Rajk was notorious as an architect of the police state and terror, the people seized the opportunity to turn the event into an anti-government rally. When a Stalinist official tried to apologise for the trial, he was almost drowned out in catcalls. A group of students later staged an unofficial demonstration. The funeral became a dress rehearsal for events three weeks later. Then on October 22, more than 5,000 students met at Budapest Technological University. They left the official students’ union and adopted a 16-point manifesto. They decided that their manifesto should be read out on the radio and organised a march for the next day. “Like so much that happened over the next days, this opening move of the revolution was haphazard, spontaneous, rudderless,” says Sebestyen. The 16 points included the withdrawal of Soviet troops from Hungary, the removal of the “criminal leaders of the Stalin-Rakosi era”, a new government under Nagy, a public inquiry into the crimes of the regime, the rehabilitation of innocent victims of the purges, a new national assembly with free elections and participation, the right to strike of workers, increases in wages and salaries, as well as freedom of opinion and expression. The scene was set for a showdown when the decision was taken to mount a demonstration. 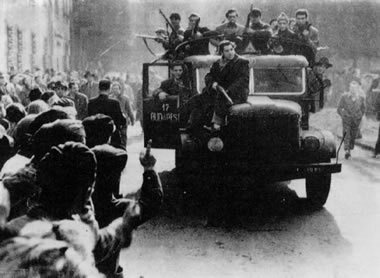 The Hungarian Revolution erupted the very next day, October 23 1956. Students were joined by workers and army cadets as they marched into town. The regime dithered, first banning then allowing the march. Up to 200,000 were on the streets as darkness descended. When the students gathered in mass outside the radio station to demand the transmission of their 16 points, the hated secret police, the AVH, opened fire. Several students were killed and others wounded. Hungarian army units arrived and refused to attack the students. Soldiers started handing guns over to students and the local police chief, the noted anti-Stalinist Sandor Kopacsi, went over to the revolution and opened weapons’ stores. By the end of the night, the radio station was ablaze and 16 students were dead along with many secret policemen. In desperation, Moscow agreed that Nagy should become prime minister – but he refused to sign a formal invitation for Soviet troops to enter Budapest. No one knows to this day who did. It’s possible that the document was forged. Events veered out of control when Soviet tanks appeared on the streets the next day. Students and workers immediately battled the tanks with rifles and molotov cocktails. A Hungarian tank commander went over to the side of the rebels, who had lost nearly 500 dead and wounded by the end of the day. The revolution, meanwhile, had spread beyond the city to the rest of the country, where Soviet troops were not present to back the authorities. A general strike began and in Csepel, the island south of Budapest, workers took over their factories. In Miskolc, the big industrial city near the Czech border, the local party boss went over to the revolutionaries. By October 25, the Hungarian government had lost power and the Communist Party had all but collapsed. The factory belongs to the workers. The latter should pay the state a levy calculated on the basis of the output and a portion of the profits. The supreme controlling body in the place of work is the workers' council elected democratically by the workers. Workers' councils elect their own leading committees composed of 3-9 members, which carry out the decisions of the council and which will carry out other jobs which these decide on. The director is employed by the factory. The workers' council elects the director and the highest employees. This election takes place after a public meeting called by the executive committee. The director is answerable to the workers' council in every matter which concerns the factory. d. decide all matters involving credit. In the same way, the workers' council resolves any conflicts about the employment of any worker. The workers' council has the right to examine the balance sheets and to decide on the use to which the profits are to be put. The workers' council handles social questions in the enterprise. By Tuesday, 30 October it seemed that Moscow had had enough. Their troops had little stomach for the fight and they started pulling back. Hungarians thought they had won a great victory and began celebrating. A statement signed by Moscow and published in the Soviet press talked of “violations and mistakes which infringe the principles of equality between sovereign states” and recognised Hungary’s right to national sovereignty. The Hungarians joy was to be short-lived. The Hungarian Revolution had produced a major crisis in Moscow. Sebestyen makes excellent use of recently-released archive material to bring out the turmoil in the Khrushchev leadership. All reports suggest that Khrushchev, at least on 30 October, meant it when he summed up the discussion by saying: “We are unanimous. There are two paths, a military path, one of occupation and peaceful path – the withdrawal of troops, negotiations. We should take the second path.” The official press praised the Nagy government. Within 24 hours all had changed and a decision taken to mount a full-scale invasion of Hungary with fresh forces from Soviet Asia. The reasons for the U-turn are not difficult to fathom. In Budapest, Nagy had formed a coalition government and was talking of free elections. The factories remained under the control of workers’ councils. The secret police had effectively been disbanded and a large group of AVH agents had been executed in full view of the world’s press. Cardinal Mindszenty, who had been held under house arrest for years, was released. If these ideas were to spread and take hold in the Soviet Union itself, then the Stalinist bureaucracy would be smashed. Although Stalin was dead, Stalinism still lived on in the form of the privileged party/state apparatus that ruled the country. The warning signs were there. The previous day there had been huge demonstrations throughout Poland in support of the Hungarians. In Rumania, all leave for soldiers and security services was cancelled after an unofficial student movement gathered momentum. At Moscow State University, KGB troops were sent to arrest students and staff who had denounced the first military intervention in Hungary. There were demonstrations in Yaroslavl, north of Moscow, with banners demanding the withdrawal of Soviet troops from Hungary. One of Nagy’s colleagues, Janos Kadar, had secretly deserted to the Russians and would return as their new proxy leader. 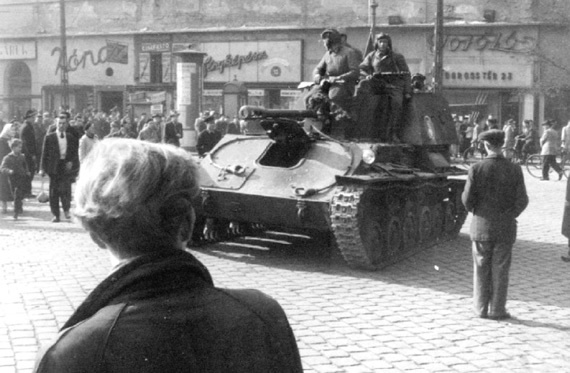 By Sunday, 4 November the Soviet troops were at the outskirts of Budapest. Some 150,000 troops had joined the invasion, along with 2,500 tanks and air support. In desperation, Nagy declared Hungary a neutral state and withdrew from the Warsaw Pact. He appealed to the United Nations and the major powers to guarantee Hungary’s neutrality. The UN secretary-general Dag Hammarskjold considered the Anglo-French invasion of Suez more important and declined to put Hungary on the agenda, even though the General Assembly was meeting at that very moment. By 7 November, the Soviet troops and tanks had crushed all resistance. Another 1,700 Hungarians were dead and large parts of Budapest lay in ruins, devastated by Russian shellfire. The Hungarian army had taken no part in the fighting on Nagy’s orders. Nagy and his comrades fled to the sanctuary of the Yugoslav embassy after their appeals to the United Nations in New York had fallen on deaf ears. Meanwhile, the Russians showed no qualms in arresting hundreds of people and deporting many to the Soviet Union. More than 200,000 people fled as refugees across the border into Austria to avoid the repression. On December 4, a month after martial law, with all demonstrations banned, 30,000 women dressed in black marched through central Budapest in what Sebestyen describes as “a silent protest for the lost revolution”. On December 11, the CWC called another strike that brought the country to a halt. This time Kadar had the workers’ leader Racz arrested after he was invited to a meeting about negotiations. Racz was later jailed for six years. Nagy and other leaders of the revolution were eventually lured out of the Yugoslav embassy and promptly seized. Kadar tried in vain to get Nagy to recant and declare his support for the new regime in exchange for his life. Nagy without hesitation turned this “offer” down. He was eventually executed in June 1958, after using the trial to denounce the invasion and declare that he was still the legitimate prime minister of Hungary. Sebestyen documents the Hungarian October revolution in great detail. He brings it to life through the contemporary statements and political histories of the participants. Although he often makes no clear distinction between Stalinism and Communism, the evidence he presents clearly demonstrates that the main character of the revolution was democratic and socialist. His book brings out the duplicity of the American government under Eisenhower and Secretary of State Dulles. The Americans made it plain to Moscow from the outset that Hungary was their backyard and was for them to sort out. They helped block any idea of intervention by the United Nations. Eisenhower pointedly refused to recognise Hungary’s declaration of neutrality. All the rhetoric about freedom and democracy was, Sebestyen contends, just that and no more. That policy continued unchanged throughout the remainder of the Cold War. In fact, Hungary’s right to self-determination was finally achieved as a result of revolutionary events inside the Soviet Union itself. From 1987 onwards, Mikhail Gorbachev began dismantling the Stalinist apparatus that had suppressed democratic and public life for almost 50 years. Gorbachev understood that he could not modernise the USSR while it was run by self-seeking bureaucrats and party careerists. He also rejected the idea that military force could sustain Stalinist rule, as had been tried in Hungary in 1956, Czechoslovakia in 1968 and Poland in 1981. Once force was ruled out, a series of revolutions swept Eastern Europe. In 1989, Hungary's Stalinists abandoned their monopoly on power voluntarily, and the constitution was amended in October to allow for a multi-party state. The last Soviet troops left Hungary in June 1991, having first arrived at the end of 1944. In his own way, Gorbachev was following in the footsteps of the Hungarian Revolution and one of his last acts as president of the Soviet Union was to apologise for the 1956 invasion. In the end, Gorbachev was undone by the reactionary Stalinists inside his own party who blocked reforms and then organised a disastrous coup attempt in 1991. This precipitated the collapse of the Stalinist bureaucracy’s power and, not long afterwards, the Soviet Union as well. Today, Hungary, other East European countries as well as the former Soviet Union are unstable states in transition to market capitalist economies. The Hungarian economy is in deep crisis and its government is discredited. The oligarchs and corrupt former Stalinists who now rule Eastern Europe have not exactly brought freedom and democracy in their wake. Global corporations now see the area as a supply of cheap, skilled labour. The ideals of the workers’ councils and demands of the Hungarian Revolution are as vital and necessary for today as they were 50 years ago. Revolution and counter-revolution in Hungary - this pamphlet was first published in November 1956. It was written by Gerry Healy, who was the most prominent post-war leader of the Trotskyist movement in Britain. The Trotskyists campaigned against the lies and crimes of Stalinism from a revolutionary socialist point of view. When the Hungarian Revolution erupted, the pamphlet’s exposé of Stalinism played a significant role in deepening the crisis inside the British Communist Party. Many leading CP members broke with Stalinism and went over to the Trotskyists during this period. 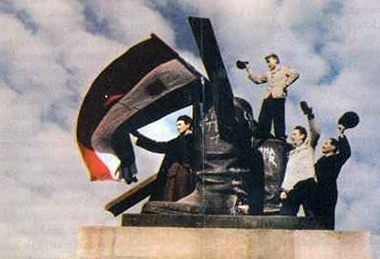 Students and workers rose up in armed struggle against Stalinism. Their courage remains inspirational. This session at A rough guide to the future on 21 October will explore its meaning for today.